The expanding “lese majeste” cases and the death in military custody as well as other arrests for offending the junta suggest that Thailand’s military bosses are seeing threats to their regime everywhere. Angst is becoming panic. The most recent example is the military’s “summoning” of Prachatai’s Thaweeporn Kummetha, editor of Prachatai English. 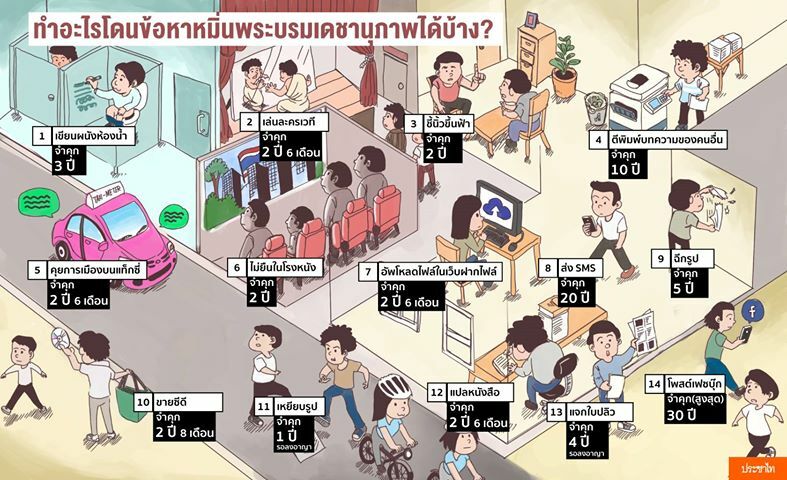 Thaweeporn was called in for publishing a rather innocuous infographic that simply displays the activities that can land one in jail for years if deemed to be lese majeste. Four soldiers showed up at Thaweeporn’s home and demanded she appear before the thought police. A total of “10 officers from the military, police and other law enforcement agencies asked Prachatai to be more careful in how it presented information” about lese majeste. It seems factual reporting is now problematic in the junta’s Thailand.